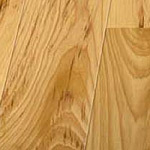 The appearance of a hardwood floor depends on the species of tree from which it is made. Each species has its own identifying grain pattern, like a fingerprint. Oak’s pronounced grain, for example, is distinctly different from the subtler grain of Maple. Determining the right species of hardwood floor depends on what you are looking for in terms of color, style, grain and overall fashion. 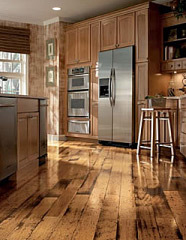 Traditional hardwoods include oak, maple and hickory. Each has a unique grain and coloring, creating a different look and feel. Oak has prominent grain lines and a traditional look that makes it the most popular hardwood, accounting for almost 90% of the market.Red and white oaks are known for durability and resistance to shock and wear. Maple has lighter grain lines, tends to be more whitish in color and doesn’t take stain as well as oak (so it looks good with a clear coat or light stain). Hickory features tighter grains that contain more heartwood than maple. Exotic refers to hardwoods that come from countries other than the US, such as Brazilian Cherry, Tigerwood, and South America Mahogany. The term “exotic” comes from the fact that the wood has a “foreign” look, with unusual eye-catching colors and grains. Amendoim’s golden amber hues combine with darker striping that is accented with a unique wavy grain variation. This is a unique hardwood floor that you may not have seen before. Brazilian Cherry’s natural reddish brown color and superior hardness has made it a favorite for all applications. Featuring distinctive and varied grain patterns, coupled with a litany of colorful hues, Jatoba matures to a beautiful, rich mosaic Tigerwood’s orange to reddish brown is accented with bold brown to black striping. This distinctive striping can vary from fine lines to heavy brush strokes. This hardwood floor gets moderately darker and richer looking over time. It is a very striking floor. This refers to hardwoods that are “distressed” during the manufacturing process to give them an aged, antiqued or hand-milled look. Hardwoods can be distressed with metal chains or a wire brush to give it the look of old, reclaimed wood that has been walked on for centuries. Or the hardwood can be hand scraped to create the look of old fashioned, hand milled wood. These woods have the same performance characteristics as traditional hardwood: but they are put through a time consuming, labor intensive process to give them the distinctive look of aged, reclaimed wood. Although it is maintained and installed similarly to hardwood, Bamboo is technically a grass. Like cork, the bamboo plant can be repeatedly harvested (every six years), making it a replenishable resource. Bamboo is preferably nailed down over a wood subfloor. However, it can also utilize a glue down, or floating installation. The natural and carmelized (steamed) colors are the most popular. Stained bamboo is also available. We have more information on our selection of cork and bamboo here.